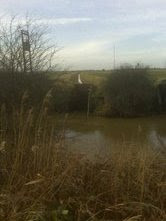 Market Weighton Canal - Where's that? I hear you ask. 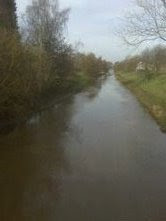 Its a 9.5 mile canal of which six miles remain navigable, located about 10 miles west of Hull. It stretches north from the Humber Estuary across flat farmland ending just short of the town of Market Weighton. This is a very obscure waterway which leads directly onto the Humber estuary and which hasn't had a right of navigation since 1971. 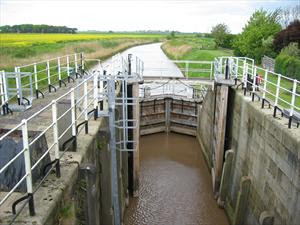 That said, the channel is navigable and Weighton Lock (also known as Humber Lock) remains operable subject to prior consent of the EA. 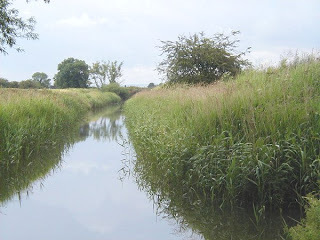 The inaccessible nature of this waterway ensures that few boats will ever venture up its short length, although NB's Earnest and Frogmoore managed the feat in 2005. I can't see myself chancing my arm in Wand'ring Bark, so I decided to satisfy my curiosity with a walking inspection whilst visiting relatives in the area. losing Mills Lock and Holme Ings Lock in the process.This upper section is now largely in filled. A limited amount of brick carrying trade continued on the lower reach til the 1950's. 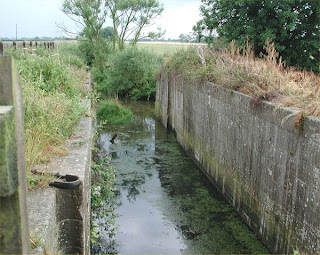 The lack of traffic on the canal resulted in a loss of the right of passage in 1971 and shortly thereafter Weighton Lock was threatened with closure, only to be saved by a local action group who managed to have it noted as a listed monument, thus ensuring its continued existence. The canal is navigable to just below the remains of Sod House Lock and a winding point is in the mouth of the Foulness River, which is itself potentially navigable for several miles when weed conditions and water depth permit. All in all this is a navigable drain very reminiscent of the drains in and around Boston - dead straight with pumping stations and very high banks. With no vessels on the waterway there are no facilities and even mooring near Newport (the only village on its route) looks tricky. As I said, not a canal I ever expect to navigate, even in a canoe, but it is an ancient structure which justified a visit on a blustery January morning. My apologies for the mixed qualities of the photos. The grainy ones were courtesy of my Blackberry and the decent springtime ones were courtesy of the local Drainage Board website and the TNC's encyclopedic photo archive. 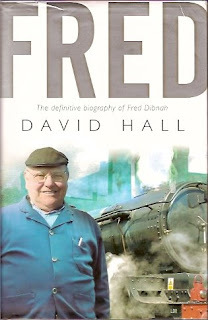 Whilst the biography of Fred Dibnah isn't really a waterways book, his fascination with all things industrial revolution makes is a worthwhile read for canal enthusiasts. Furthermore, he was an active canal enthusiast in the Burnley / Manchester area and a great advocate for restoration, so I am allowing his book into the "waterways" section of my library. Fred feels like a permanent fixture in my life, with vivid imaged of the early series "Fred Dibnah, Steeplejack" an essential part of my adolescence. The book takes a candid look at his life and passions with a particular bias towards his developing role of TV presenter. This bias is understandable as the author, David Hall, was his producer for many years and was therefore particularly well placed to observe this aspect of his persona. The book tracks his life from an under performing student in Burnley, through his joinery and steeple jacking career and finally into his TV presenting role, whilst all the time following the ever expanding living museum in his back garden and the gradual restoration of his two steam engines, not to mention the replica coal mine! Fred comes across as a man utterly obsessed with the Victorian era and steam power. So obsessed that his family life and his finances suffered and, just as stability arrived in his later years, his health failed, robbing us of one of England's finest characters. The book contains many direct quotes and it is impossible not to hear his Burnley accent booming out of the pages. An absorbing read for those this a passion for the industrial revolution. It's always good to get the first run of the season under ones belt. I have plans to try and document the waterways journeys I took with the Captain Snr, Matilda and sometimes my brother during the late 1960's and 1970's. These plans moved one step closer this weekend with an overnight stay on Wand'ring Bark with my brother, who was part of the crew on the earlier trips. Our plan was to take the boat to Penkridge, have a pub meal and then spend the evening sorting through the many boating transparency slides taken between 1967 and 1979. The weekend had been scheduled in the diary for months, so a little bit of frost wasn't about to put us off. 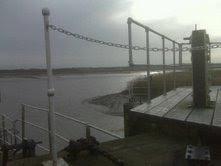 We arrived at Calf Heath to find WB covered in rhyme and the marina covered in a thick layer of solid looking ice. 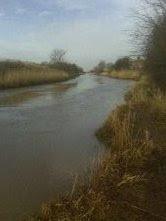 However, an inspection of the cut at the junction with the Hatherton Canal gave some hope, it was ice free. We got the stove going and, after a bit of effort, eased WB out of the marina. Our initial optimism was dashed when we turned the first corner and were confronted by a solid sheet of ice which stretched from bank to bank. Never mind, "I'm sure it will clear up soon" I said as we crunched into the ice floes. Predictably, things didn't clear up and is was soon apparent that we wern't going anywhere near Penkridge, not even Gailey for that matter! We quickly revised our ambitions and decided to make for the winding hole at Calf Heath bridge, alongside the Four Ashes chemical works. Even this turned out to be a challenging target, but by the time we had moved a mile we didn't fancy stern hauling the boat all the way back! The ice got thicker and thicker, with the boat grinding its way along and chunks of ice skittering away from our bow. We finally made it to the winding hole and thankfully, the water under the bridge was ice free, which gave us some room to rope the boat round for the return trip. Rather than face the ignominy of a quick return (we had acquired quite an audience on our departure) we stopped for lunch, warming our numb fingers and watching the local model aeroplane club test a model jet. I had never seen a remote controlled jet before and the high minimum speed made for a very interesting landing. After a lazy lunch and much catching up we made easy passage back through the path we had cut, returning to our berth as the sun faded at 3.30pm. Don't even think about the blacking on the bows..... what blacking? Our plans for a pub meal evolved into drive to the Fox and Anchor at Coven, where we secured a prime fireside spot and whiled away a couple of hours, only to return to the car and discover that thieves had smashed the side window, trying to steal a non existent Sat Nav and ipod in the glove compartment. Great. After a chilly trip back we attacked the old photos, sorting them into chronological order on a light box my brother had purloined from a hospital. The slides were rarely labelled and at best they had a cryptic caption like "leaving a lock near Birmingham" - thanks Captain Snr!. However, we applied ourselves to the task sorting them initially by boat and then, by looking at the backdrops and searching our combined memories, we managed to piece together the likely routes we had followed. Finally, we tried to put them into a timeline based on the ever maturing face of yours truly (I was seven when we started). In the end it was rather like a jigsaw of our past - thoroughly enjoyable for us but totally boring to anyone else. Neither of us have been very good and recording our pasts ,and this exercise proved the benefits photographic records. They provided memory triggers of things in the past, events which should be remembered. In spite of a clutch of degrees and diplomas between us, we found evidence of trips we had completely forgotten, and photos of friends and families that had joined us, many of whom are either dead or forgotten. The moral of this story is; don't throw out your old slides or prints - stick them in a box because you never know who may want to rake over the past in 40 years time! The next step is to convert these faded images into a digital format which will then persist in glorious sepia for ever. When this task is complete I will publish the photos in the blog, preserving the past on line in case my hard drive fails. We settled down for a good nights sleep at 1.00am, with the stove warding off the frost. Interestingly, the on board thermometer indicated that the air temperature inside the boat dropped to minus 8 during the week, testing the integrity of the pipes and anti freeze to the limit.